Overview: Early December 1941. While America has not entered the World War in Europe, the signs are pointing to the United States getting involved soon. President Roosevelt reaches out to members of the Justice Society to form a protection force for the American people. Call them an All-Star Squadron if you will! And so, a new team of heroes representing the greatest generation of heroes is formed. 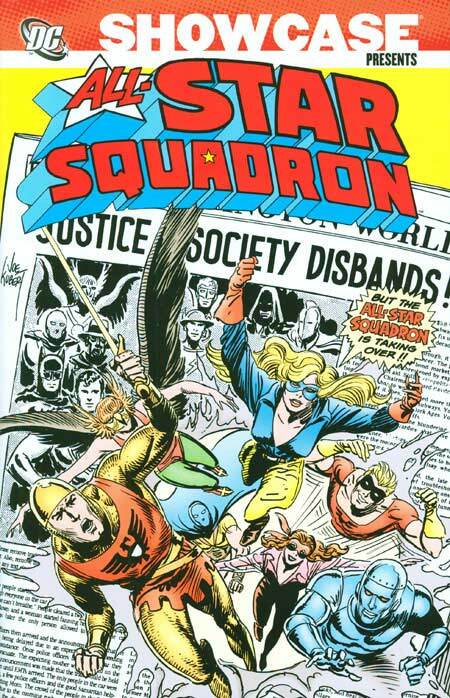 While the Justice Society disbanded for the duration of the war to serve in the military, the members of the All-Star Squadron took over. Liberty Belle, who drew her power from reverberations from the Liberty Bell in Philadelphia; Johnny Quick, who uses the mathematical formula 3X2(9YZ)4A to run at super speeds; Firebrand, who takes her codename from her brother injured at Pearl Harbor and her powers from the Pacific volcanos; Robotman, who proved once again that anyone can be human with either skin or metal; and Commander Steel, a Captain-America wannabe with Wolverine’s skeletal structure. Other heroes, such as Plastic Man, the Shining Knight, the Atom, and Hawkgirl would drop in and drop out as needed to protect FDR, Winston Churchill, and freedom everywhere. Why should these stories be Showcased? : Yes, yes, a thousand times yes. This should be a must-read for historical comics, wherein the story takes place in a definitive time (in this case, December 1941 and January 1942). Writer Roy Thomas has done his research, resurrecting characters who appeared in comics in the early days of the Golden Age.There wasn’t a need to create an entire line-up of new characters, as plenty of characters were already available to use. Thomas was able to create a core team for these stories of Liberty Belle, Johnny Quick, Firebrand, Robotman, and Commander Steel, and then bring in various members of the Justice Society as needed. This was one of the first comics I read on a regular basis, providing me monthly history lessons on both DC characters as well as the events of the early days of World War II. Please give this a look. Footnotes: Sit back, people, I am not happy with DC with this collection. Specifically, the 1982 team-up between the Justice League, the Justice Society, and the All-Star Squadron. This story ran across five issues: All-Star Squadron #14 & #15, and Justice League of America #207, #208, & #209. Reviewing the Contents list above (if you haven’t read this collection), you’ll notice that the JLA issues are not included in this volume. What?!?!? Please, DC, tell me why you would not include them! Adding the three more issues to this collection would have pushed the book close to 600 pages. No big deal, DC has had (and will have) larger Showcase Presents. Or omit the final three All-Star Squadron issues in this collection, and keep the page count roughly the same. What is worse is that DC nearly repeated this same lack of common sense! DC has a line of books, Crisis on Multiple Earths, collecting the numerous JLA-JSA team-ups. When Volume 6 of this line was first solicited in the summer of 2012 (just months after this Showcase Presents release), it included the three JLA issues from the JLA-JSA-All-Star Squadron team-up, but it did not include the All-Star Squadron issues. The fanbase exploded online, and eventually DC re-solicited the Crisis on Multiple Earths book with the All-Star Squadron issues included. So, if you would like to read the complete story, please track down Crisis on Multiple Earths Vol. 6. Because you can’t read the complete story in this volume. If you like this volume, try: reading Roy Thomas’ take on World War II superheroes at Marvel Comics, with The Invaders. Thomas did his take on the Golden Age heroes from Marvel leading the charge against the Axis powers. Roy Thomas first introduced the Invaders in Avengers #71 (December 1969), but it would not be until 1975 before the team got their own title. Captain America, Bucky, Human Torch, Toro, and Namor the Sub-Mariner formed the core of the team, but other heroes would soon join the team, such as Miss America and Union Jack. The series ran for nearly four years, before coming to an end with issue #41. Marvel released two volumes of a Complete Collection in 2014, collecting the entire series plus some other appearances outside the title. This entry was posted in All-Star Squadon, DC Showcase Presents and tagged Adrian Gonzales, All-Star Squadron, Don Heck, Jerry Ordway, Rich Buckler, Rich Hoberg, Roy Thomas. Bookmark the permalink.